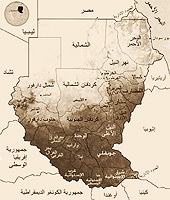 Though as many as 134 Languages are spoken in Sudan, Arabic is the country's official language. Our module focuses on the dialect spoken in Khartoum and is designed to be a primer in the Sudanese dialect of Arabic for students who have an intermediate to high level of proficiency in Modern Standard Arabic, providing an opportunity to familiarize with the sounds, vocabulary, and grammar of Sudanese Arabic. How does Sudanese Arabic compare to Modern Standard Arabic? What are the influences on Sudanese Arabic? How has Arabic spread throughout Sudan? What other languages are still widely spoken in Sudan? Do you have an intriguing question? Contact us. Module Teaching Resources: Resource created by the Understanding Sudan project. Review of Bergman's Spoken Sudanese Arabic: Grammar, Dialogues, and Glossary. By Alan S. Kaye, in California Linguistic Notes, Volume XXVIII No. 1 Fall, 2003. A. Introduction to Sudanese Arabic: Five Lessons. Table of Contents.By Shane Bauer. 2008. B. Introduction to the Text. C. Chapter 1 - Introductions. D. Chapter 2 - Life and Culture. E. Chapter 3 - Life in America Compared to Life in Sudan. not uploaded yet. F. Chapter 4 - Women in Sudan not uploaded yet. G. Chapter 5 - Sudanese Arabic Dialects. Arabic Without Walls. An introductory distance-learning Modern Standard Arabic course funded by FIPSE and developed by the UC Consortium for Language Learning & Teaching, The National Middle East Language Resource Center at Brigham Young University and Near Eastern Studies Department at UC Berkeley. Conversations in Sudanese Arabic, Video 1 of 4 Mustafa El-Jaili and W. Stephen Howard. Conversations in Sudanese Arabic, Video 2 of 4 Mustafa El-Jaili and W. Stephen Howard. Conversations in Sudanese Arabic, Video 3 of 4 Mustafa El-Jaili and W. Stephen Howard. Conversations in Sudanese Arabic, Video 4 of 4. Mustafa El-Jaili and W. Stephen Howard. Languages of Sudan. From SIL's Ethnologue. Wikipedia Entry on Juba Arabic. Wikipedia Entry on Sudanese Arabic. Juba Arabic English Dictionary/Kamuus ta Arabi Juba wa Ingliizi. by Ian Smith and Morris T. Ama. May 2005. Uganda: Fountain Publishers. Pp. 213 . North American distribution through African Books Collective, Oxford. Spoken Sudanese Arabic: Grammar, Dialogues, and Glossary. By Elizabeth M. Bergman, 2002. Springfield, VA.: Dunwoody Press. Pp. xix, 393. Audio tape also available. Sudanese Arabic: Phonematics and Syllable Structure. By James Dickens. 2007. Wiesbaden, Germany: Harrassowitz Verlag. Pp. 140. Contents are listed here.